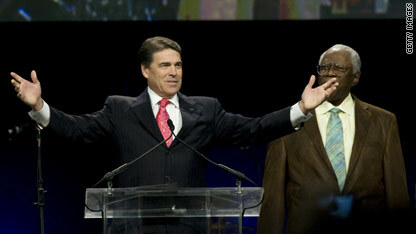 Austin, Texas (CNN) – Rick Perry’s new church is not like his old church. At his new church, several hundred worshippers showed up in jeans on a recent Sunday to listen to high-decibel Christian rock from plush stadium-style seats. The crowd, mostly under the age of 40, raised their hands to Jesus in between sips of freshly brewed coffee from the java hut in the lobby. Outside Lake Hills Church – situated on 40 acres about half an hour’s drive from downtown Austin – a dozen sheriff’s deputies managed the Sunday morning traffic rush. Back in town at Perry’s old church, a graying, neatly dressed crowd of several dozen gathered for services in a stately sanctuary, singing old hymns and reciting communal prayers from hard wooden pews. There is no java hut at Tarrytown United Methodist Church – and not nearly enough traffic to justify sheriff’s deputies. Perry’s jump from Tarrytown to Lake Hills mirrors some of the big recent changes in American Christianity: From cities to suburbs, from a formal mainline worship style that relies on liturgy to a more casual evangelical approach that’s all about connecting to Jesus. The Republican presidential candidate’s 2007 church switch also may mirror something much more personal: The culmination of Perry’s journey from a mainline Protestant upbringing to an evangelical-flavored faith built on close relationships with Baptist preachers and giving public testimony about God. Politically, his faith evolution creates an opportunity for Perry to connect with the evangelical voters who constitute the Republican Party’s base at a time when some say he’s the only candidate who stands any chance of derailing Mitt Romney’s bid for the GOP nomination, even as he has fallen behind Romney and Herman Cain in the polls. 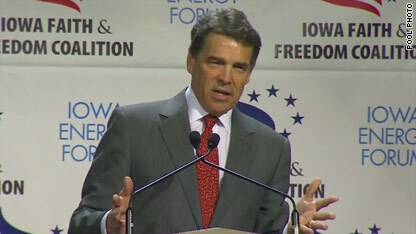 Perry speaking at an Iowa Faith and Freedom Forum in October. The Texas governor has made his faith a centerpiece of his presidential campaign in ways both overt and subtle – hardly the first time he has enthusiastically mixed religion and politics. At a time when Americans have grown accustomed to hearing public officials invoke a kind of generic national religion that’s sensitive to diverse faith traditions and nonbelievers alike, Perry has often gone a big step further, telegraphing a distinctly Christian message. For instance, when Perry lent his signature to a Texas ballot initiative to constitutionally ban gay marriage – an effort that didn’t even require the governor’s endorsement – he did so on a Sunday from inside an evangelical Christian school. And the four-term governor often speaks of a culture war between the nation’s Christians and secular humanists, who he says are trying to stamp religion out of the public square. Now, as he wages an uphill battle for the Republican nomination, Perry is emphasizing his Christian commitment even more than in the past, trying to line up support from conservative Christian leaders and religious voters nationwide. Some friends of the governor say he sees his presidential quest as a kind of mission from God. “He said he didn’t want to do it, but he felt the Lord was calling him,” says Kelly Shackelford, who recently heard Perry discuss his campaign with religious activists. Rick Perry grew up in tiny, isolated Paint Creek, an unincorporated farming community on the dusty plains of central Texas. 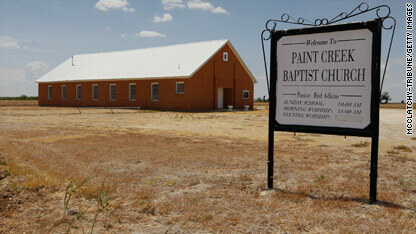 Paint Creek “was on a farm to market road where they had this Methodist church on one end and a Baptist church on the other and the school in the middle,” Perry’s wife, Anita Perry, told CNN. Paint Creek’s Baptists dominated local government and imposed a strict moral code, prohibiting school dances and Halloween carnivals, reasoning that carnival games were tantamount to gambling. “The school board was nearly all Baptist, and they drew up a dress code every year that was very concerned with hair and short pants and exposing too much skin,” says Wallar Overton, a childhood friend and Perry’s neighbor in Paint Creek. Overton’s parents, who were Methodists, once held a prom in their house to get around the school’s ban on dancing. Wallar Overton, Perry’s childhood neighbor from Paint Creek, Texas, says Baptists dominated local government and imposed a strict moral code. Perry said his family was active in both churches when he grew up in Paint Creek in the 1950s and ‘60s. Perry’s campaign declined interview requests, but his religious friends say his early exposure to both Methodists and Baptists initiated him into the two main branches of American Protestantism – mainline and evangelical. Mainline Methodists tend to stress good works, while evangelical Baptists focus on personal relationships with God. When Perry was growing up in Paint Creek, there was a Methodist and a Baptist church. Only the Baptist congregation survives. Perry has spoken in scores of Texas churches since becoming governor in 2000, including visits to black churches for Juneteenth, the annual holiday commemorating the arrival of news that President Lincoln's had ended slavery. Perry’s ties to Texas’ black and Hispanic communities are largely built around faith-related issues such as abortion and gay marriage, on which polls show minorities tend to be more conservative than whites. Though Perry attended the occasional Baptist revival in Paint Creek and appears to identify as an evangelical today, Overton says the governor was raised squarely in the Methodist church, attending Methodist services and Sunday school, taught by Overton’s mother, every week. Years later, when Gov. Perry actively supported the death penalty and cuts in government programs for the poor - positions that clashed with the more progressive stances of the United Methodist Church - some fellow Methodists speculated that Paint Creek’s cultural conservatism shaped the governor more than his church did. When Perry landed back in Paint Creek in the late 1970s, after college at Texas A&M and a four-year stint as an Air Force pilot, its small-town ways helped provoke an identity crisis for the future governor. Then 27, Perry had been around the world flying huge C-130 cargo planes for the military. But in 1977, he found himself back on the family farm helping his dad. After a lifetime of structure – Boy Scouts, the Corps of Cadets (a Texas A&M program similar to ROTC), the Air Force – Perry was adrift, struggling to find a path in the face of a wide-open future. “I was lost, spiritually and emotionally, and I didn’t know how to fix it,” he told Liberty University students in his September appearance there. For someone who had served as an aircraft commander, the move home felt like a demotion. “I came back into my old room. I swear to God I know mother cleaned it, but it looked exactly like it did the day I left,” Perry said at a May fundraising event for a Christian prayer rally he helped organize. Perry says that he found resolution, while still 27, by turning to God. “My faith journey is not the story of someone who turned to God because I wanted to,” he told students at Liberty, in what has become a mainstay of his speeches to Christian audiences. “It was because I had nowhere else to turn. While being “born again” is considered an important milestone for many evangelicals, Perry isn’t known to describe his experience in 1977 Paint Creek in such terms. Despite the evangelical overtones of Perry’s life-changing encounter with God, he and his wife joined a Methodist church when they landed in Austin in the mid-1980s, continuing his mainline childhood tradition. 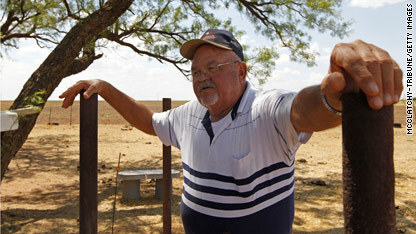 Perry had been elected a state representative as a Democrat from a rural West Texas district in 1985. He was following in the political footsteps of his father, who was a county commissioner at the time. In 1990, after switching to the Republican Party, Perry was elected agricultural commissioner, his first statewide office. Later, one of the capital’s other prominent families – the Bushes – joined the Perrys at Austin’s Tarrytown United Methodist Church. The Tarrytown United Methodist Church in Austin, where the Perrys attended until 2007. George W. Bush was elected Texas governor in 1994, and he, Laura and their two daughters began attending Tarrytown. By that time, Tarrytown had gained a reputation as a conservative alternative to Austin’s First United Methodist Church, which is right next door to the state Capitol and boasted high-profile Democratic attendees like Ann Richards, the governor of Texas from 1990 to 1994. During the 1990s, the Perrys and Bushes were among the worshippers who made a tradition of distributing Holy Communion during Tarrytown’s Christmas Eve services. The Perrys also helped lead confirmation classes as their two children prepared to be confirmed in the church. Perry was elected lieutenant governor of Texas in 1998, inheriting the governor’s office two years later when Bush left Austin for the White House. Jim Mayfield, senior pastor at Tarrytown from 1988 to 2006, says the Perrys generally kept a low profile at the church. 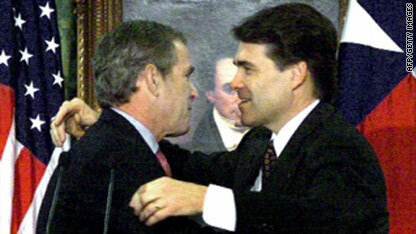 Perry and then-Texas Gov. 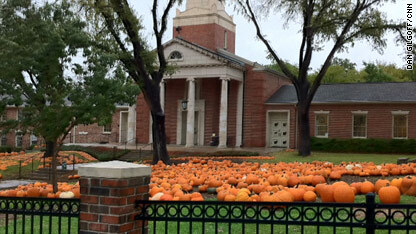 George W. Bush attended the same Methodist church in Austin. At the same time, Perry was forming close relationships with evangelical pastors across the state. “I’ve known the governor in a personal way for 20 years, since he was agricultural commissioner,” says Ed Young, a prominent Baptist preacher based in Houston. “I see God’s hand leading him and working in his life. In 2007, when the Perrys moved to a rented house in West Austin during a governor’s mansion renovation, Young encouraged them to check out an evangelical-style church a protégé had started nearby. That congregation, Lake Hills, has been Perry’s church home ever since. For some of Perry’s evangelical friends and supporters, his jump from a mainline to an evangelical church was a sign of spiritual growth. Anita Perry, meanwhile, says she misses her old church, Tarrytown. “I miss those traditional hymns,” she told CNN during a recent campaign visit to Bob Jones University, a fundamentalist Christian school in South Carolina. “The contemporary music [at Lake Hills], you know I hear it and I hear the beat. I hear the words, but I don’t know the words,” she says. “I didn’t grow up in that church; I grew in a traditional church. In late 2004 as Election Day approached, polls showed the country about evenly divided between Perry’s political ally, President Bush, and Democratic challenger John Kerry. Perry was worried. He headed to a dry creek bed somewhere outside Austin and called his friend James Robison, a Dallas-based televangelist. Robison had been friends with Presidents Reagan and Bush and had fielded many calls from Gov. Perry. The Baptist preacher said he was moved to learn his state’s chief executive was spending a day alone in the wilderness, praying. For Robison, the call was “strictly spiritual.” But it could also be seen as evidence of Perry’s effortless fusion of faith and politics. Perry, center, at a memorial for the crew of the space shuttle Columbia in Lufkin, Texas, in 2003. In Austin, Perry’s political fans and foes alike say that fusion is best reflected in his track record on abortion. Supporters say the record testifies to Perry’s faith-based commitment to life. Critics say the governor has overstepped, compromising women’s basic health care in the name of ideology. They note that state funding for Planned Parenthood was barred from going to abortions even before he cut it. And they say the sonogram law Perry signed requires doctors to read biased information to women seeking abortions. “As governor of Texas, Rick Perry has pursued a single-minded agenda: Take away women's health care, destroy Planned Parenthood, and block women's access to safe abortion care,” the Planned Parenthood Action fund wrote in a recent petition drive. More recently, Perry has become an outspoken advocate for religion in the public square and a vocal opponent of those who don’t believe in God. Elsewhere in the book, which tracks what Perry calls a secular war against the Boy Scouts, he characterizes evolution as an inherently atheistic idea. Many scientists and believers would no doubt disagree with the governor. Polls show that tens of millions of Americans back evolution and also believe in God. Perhaps Perry’s most audacious religious gesture as governor came in August, when he organized a prayer rally in the stadium where the NFL’s Houston Texans play. The event came a few months after Perry had proclaimed three days of prayer for rain in Texas amid the state’s long drought. Robison, who helped launch the Christian Right in 1980 when he organized a meeting between then-candidate Reagan and pastors in Houston, says he approached Perry with the idea for the rally late last year to confront what Robison said was a national moral crisis. Perry at The Response prayer rally in Houston. "We have been besieged by financial debt, terrorism and a multitude of natural disasters," Perry said in the run-up to the rally, which organizers said drew 30,000 people. Billed as a “day of prayer and fasting,” it also involved dozens of conservative Christian leaders whose support is coveted by most of the Republican White House hopefuls. But Perry's aides insisted The Response had nothing to do with presidential ambitious. Aides say that calls for Perry to consider a White House run came only after other big-name Republicans, like Mike Huckabee, Mitch Daniels and Haley Barbour, announced they would not run. And that happened after Response planning was already well under way. Skeptics argue that Perry, the longest-serving governor in Texas history, had to be at least pondering a White House run since late last year. 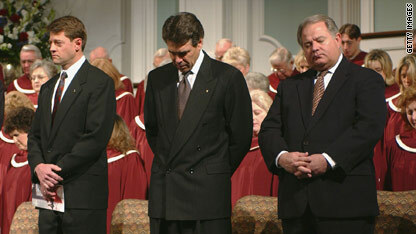 Either way, the prayer event created a major political opportunity for Perry. Intense media coverage allowed him to broadcast his Christian commitment to a national audience just one week before formally launching his presidential campaign. Perry’s Christian messaging could be especially important because Romney, the perceived Republican frontrunner, is a Mormon. Many evangelicals don’t consider Mormons to be Christian, and flaunting his faith could be a way for Perry to distinguish himself. Last month, a Baptist pastor who introduced Perry at a major conservative gathering stirred controversy by calling Mormonism a cult. Perry has said he disagrees. In the months since The Response, Perry’s courtship of national Christian leaders has intensified. With Romney locking up support from much of the Republican establishment, Perry is working overtime to shore up his party’s socially conservative base. Just a few weeks after the Houston prayer rally, roughly 200 religious leaders from across the country, mostly evangelicals, descended on a San Antonio-area ranch for the chance to meet Perry and his wife. Over the course of a Friday afternoon and a Saturday morning, Rick and Anita Perry talked up the governor’s record and took questions from the audience. James Dobson, founder of the evangelical group Focus on the Family, served as moderator. Robison, one of the attendees, said the Perrys talked to them for six or seven hours. Another attendee, Christian activist David Lane, said one audience member asked Anita Perry what people would be most surprised to learn about her husband. For the Texas-based pastors and activists in attendance, that was hardly news. But to scores of others who were just getting to know Perry, it was reassuring information. “As governor, people are not asking you, ‘Tell me when you came to the Lord,’” says Shackelford, who has known Perry for more than a decade. “The people you hang out with every day already know. Adhering to are a handful of recommendations that will assist you in deciding on the most effective company. The scope for these services in modern situations is incredible. 21bf Paul your dates are correct for Augusta, Georgia at that time too. It was Advent of 1969 and I rbemmeer our pastor telling us about the new missal, but when we got it it seem to me to be what we were already doing for about three years except for the extra section of solemn blessings. Of course I'm recollecting this from being a an 11th grader at the time. I think the offertory prayers and the additional Eucharistic prayers and the new rubrics as well as the penitential rite and the order of the final blessing and dismissal were well in place before the 1969 missal. that the Vatican recognitio was oranlgiily just a guarantee that the translations were theologically sound; only with Medina did the Vatican begin micromanaging the language of the translations (often judged by non-native speakers). Translation and inculturation of the liturgy does not normally involve grave questions of faith (though some nuts have tried to claim that the English liturgy has been infiltrated with Pelagianism and Modernism since 1973). Rather it is a question of pastoral imagination, sensitivity, and efficacity. But you are right that pastoral failure can undermine people's faith and that is precisely why the new translation is a catastrophe for the Church. when has Weiner ever talked about Jewish naitonalism ? show me the source, where's the clip ? Anthony Weiner was great for the average American and that's why the republicannots and corporations spent millions of dollars to get them out ! I hope Obama give them both cabinet positions when he wins his second term ! Thanx for this information, I've been looking everywhere. Cheers! GOD: God is the Creator of the universe in all its dimensions and the source of Knowledge in all sentient beings. God has sent a New Revelation, a Teaching and a Pathway to rekindle humanity’s relationship with the Creator as we face living in a declining world. The New Message comes with the Will and Power of God to unite the world’s religions, to end our ceaseless conflicts and to call forth the greater gifts that each person has brought into the world. The New Message is the largest Revelation of its kind ever to be given to humanity. We stand at the threshold of Great Waves of environmental, economic and political upheaval and change which will alter the face of Earth. Humanity must unite to prevent collapse from within and subjugation from without. Each of us has been sent into the world for a greater purpose, waiting to be discovered. This greater purpose resides beyond the realm and the reach of the intellect, in Knowledge that lives deep within us. KNOWLEDGE: Knowledge is the core reality within us, a deeper mind beyond the intellect, and is our direct connection to God. Knowledge represents the part of us that has never left God. Instinct and Intuition are at the surface of Inner Knowledge. We live in a Greater Community of intelligent life in the universe for which humanity must prepare. We live in both a mental and physical environment. The mental environment contains forces that affect our thinking and emotions and that can dominate us until we become strong with Knowledge. These are all assertions for which you have NO evidence of. Perry is not like Obama ( a Anti-American ). Rick Perry is dumb as a wad of gum. I am a 35 years old CEO, ri;ch and strong but still sin;gle ... now I am see;king a good woman who can give me a real love, so I joined BillionaireFriends.COMit's the first and best club for wealthy people and their adm;irers. Well, you don’t have to be rich ,but you can meet one there. Religion and politics should NEVER MIX. The fact that this nutbar is even a contender should frighten everyone. I just hate the use of Religion as a con to get votes....It's so obvious with Perry, it's obvious he's intelligently inferior to Romney, Gingrich and the rest of the crowd so he has to try and produce a trump card, and that's Religion. We all know the only reason Perry changed churches is he figured he'd get more VOTES from this one. Like some others who are always screaming about their "faith" and their "beliefs," it's all about forcing others into those "beliefs" by misusing the law. They're "christianists," a part of the GOP, not a church. Oh my Newton we need to gather one and all believers in the need to set this country free of religion and all its insanity, lies, and least I forget crimes. A non-beliver as president is what we need. I’m not saying you can’t worship your god or gods. I’m not saying that you cant celebrate its birth, but what I am saying is you cant use the US government to further your agenda and make this country into some kind of religious state that’s not what this country was founded on but escaped from God and King. Religion had its time it was called the dark ages. As for Rick Perry the man is not to be trusted nor anyone who says god spoke to him, better Idea would be to seek mental help from licensed professionals. perry can try to discredit gingrich & romney all he wants-but it is not going to help him. perry need to go back to Texas & serve out his term as governor. Maybe then he will have a chance to actually pick up a Bible & study it- & help his comprehension. How can he call himself a Christian-but is willing to execute a person-it there is a possibility of their innocence? So Rick Perry thinks religion is something that should be fun and not require any commitment. Fun, as in telling gay soldiers that risk their lives to protect his right to worship of pine cone if he wants that they ruined Christmas.